I guess you could say this is just a part of winter. The weather is either too cold and/or wet for flying or its beautiful and there’s no wind. Really it’s been grey and rainy a lot lately. While you would think this is good weather to work in the craft room making kites, I just haven’t been inspired. It’s taken a long time but I did finally finish the kite for the nursery. The one my daughter asked for last summer. It’s not that it was too complicated. I think my perfectionism got in the way as I worked on it. Anyway, it is done and it looks pretty good. 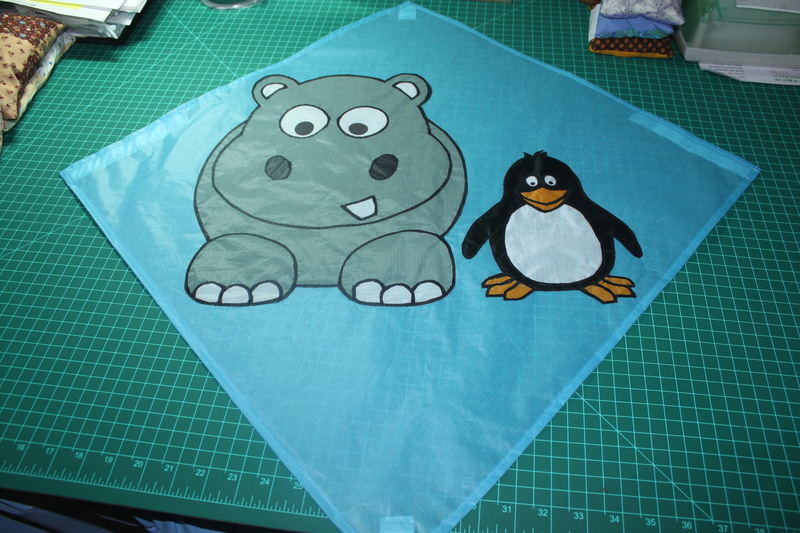 I have my next kite project cut out ready to sew. A pocket sled. However, it is going on hold. There is something new and different that has moved up to the front of the line. Something I’ve never tried before and haven’t read or seen anyone try lately. Last night I stayed up way too late cutting out the template for this project. I’ll make a smaller prototype first just to see if it will fly. If it does, then I will start on the real thing. This sounds like I really know what I’m doing. Oh, so far from the truth. I added a “new” kite to my vintage kite collection. A Joel Scholz Butterfighter, signed and dated June, 1991. There’s a little bit of fine tuning that needs to be done to the sparring but it should not be a problem. I am lucky that I have a kite shop close by and they have just about every kite known to man. I was able to compare my kite with a brand new Butterfighter and see what needs to be done. Believe it or not, everything I need is found at the local hardware store. None of this specialty stuff that you can’t get from anyone except the manufacturer. Just dowels and O-rings. When I get it ready and have the day to fly, I’ll have photos. « Wind! We Got Wind!